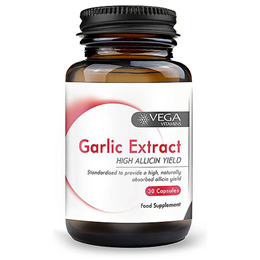 Vega Vitamins Garlic Extract is a perennial herb that may help to support the cardiovascular and immune system. It has a standardised allicin content and has been deodorised to reduce the strong odour. Garlic has primary components that provide health benefits such as sulphur constituents and has an exquisite defence system, protecting itself from bacteria and fungi. Garlic also known as "Poor man`s treacle" is a perennial herb whose bulb is composed of small cloves and is readily identifiable by its peculiar odour. The odour is due to the many different sulphur constituents found in the cloves. European folklore gave garlic the ability to ward off the "evil eye" and traditionally, braids of garlic were attached to the entrance of homes for protection from evil. Garlic Sandardised Extract (Allium Sativum), Vegetarian Capsule Shell (Hydroxypropyl Methylcellulose)), Anti-caking Agents (Magnesium Stearate, Silicon Dioxide). As a food supplement for adults, take 1-2 capsules daily with food or as directed by a healthcare professional. Do not exceed recommended daily intake. 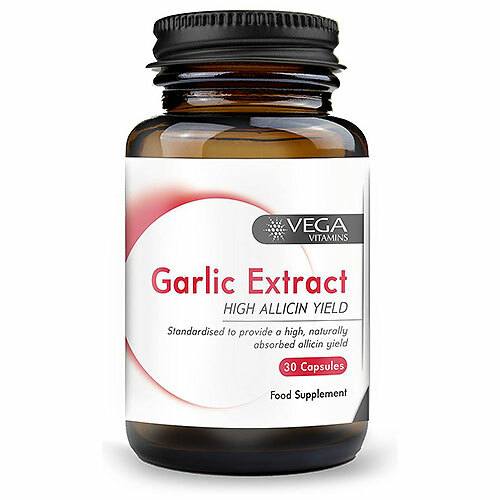 Below are reviews of Vega Vitamins Garlic Extract - 30 Capsules by bodykind customers. If you have tried this product we'd love to hear what you think so please leave a review.